What wine do Emmy Award Winners Drink? 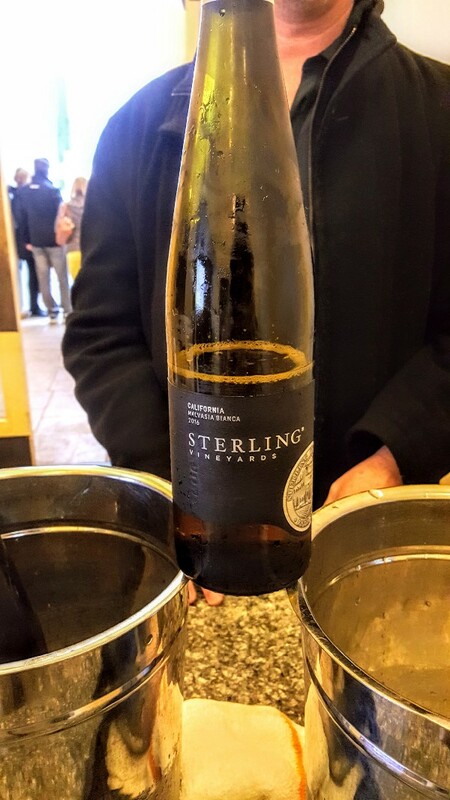 Sterling Vineyards of course!! What do Sterling Brown and I have in common? NOT a damn thing!! Well maybe this wine! They say the early bird gets the worm. Well this year, I was the early bird. 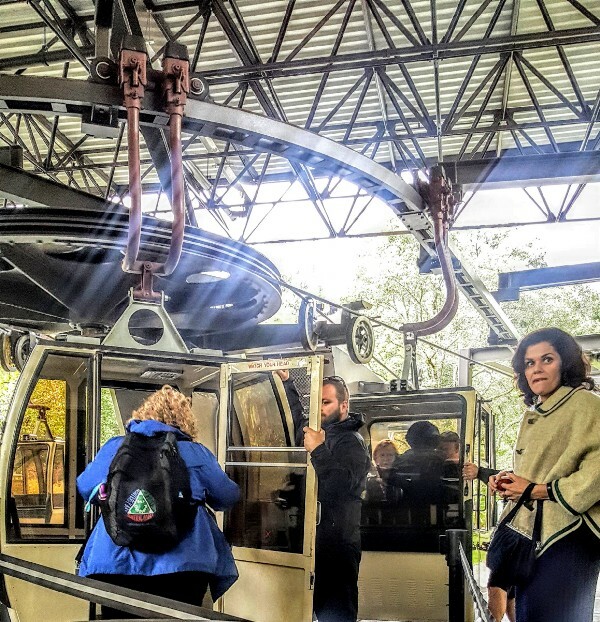 The 2017 Wine Bloggers Conference was located in Santa Rosa, California. This was the 10th year anniversary. I was beyond thrilled! This is my second Conference. I have never been to this region. Last year, I missed out on the all tours. The excursions sold out faster than you could blink. This year I was on it. 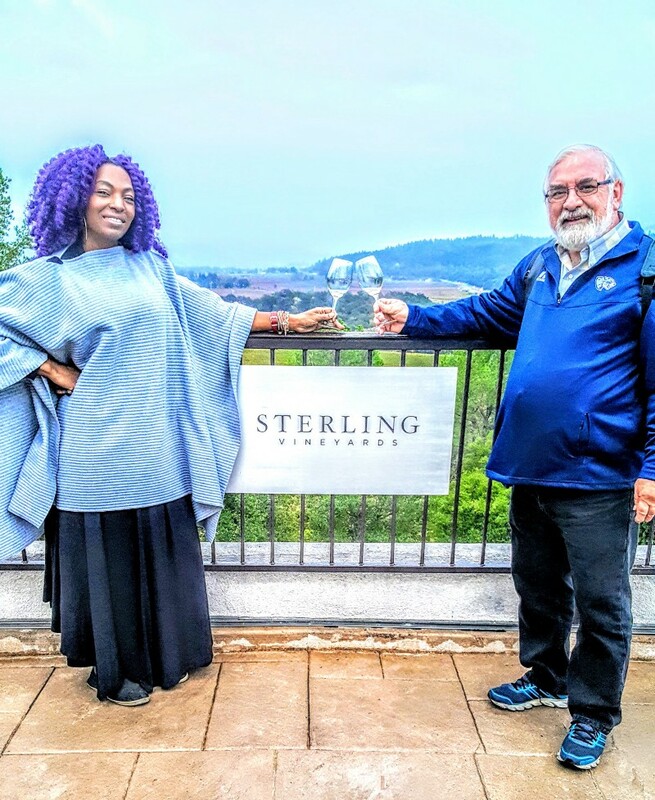 Our first pre-excursion was to Sterling Vineyards. 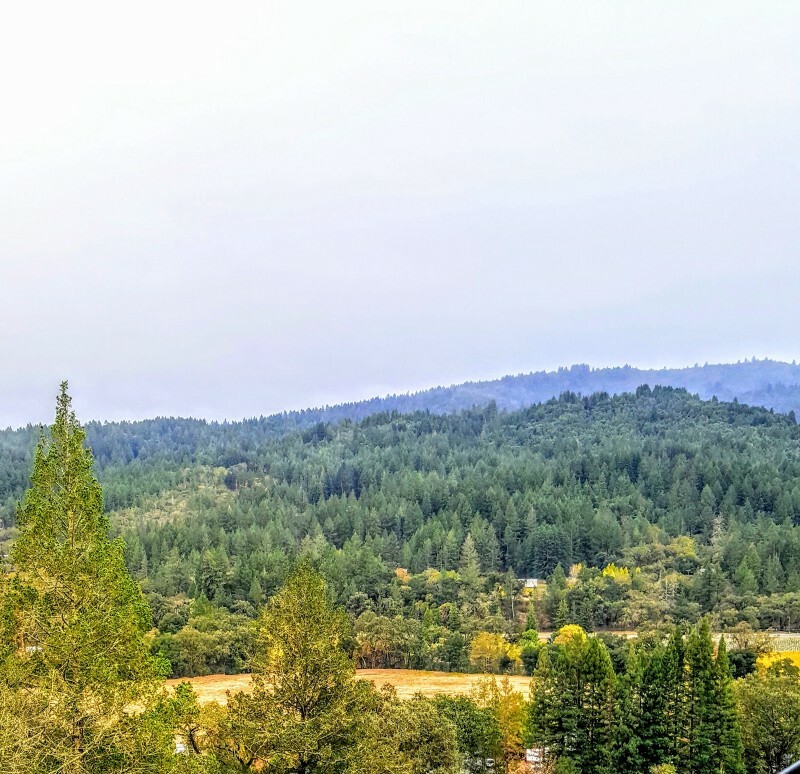 Sterling is a large property located in Calistoga, Ca. We drove about 30 minutes away from our hotel in Santa Rosa. Ms. Ginevra and Mr. Caudill of Treasury Wine Estates, were our tour guides on the way to the property. 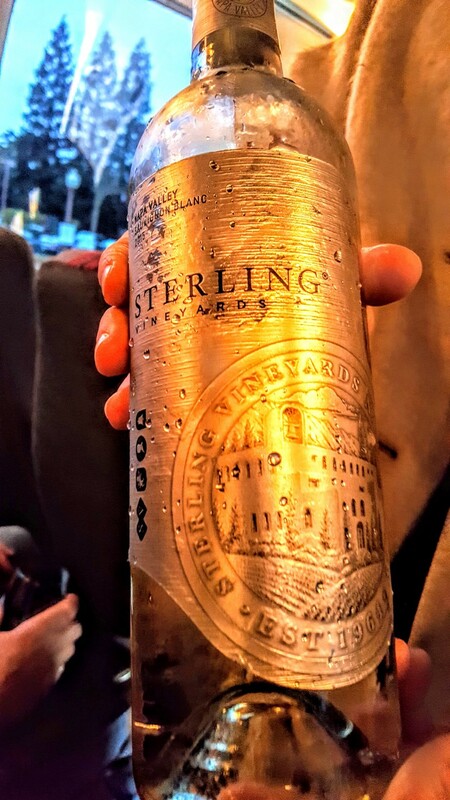 While on the bus, we were given a taste of the 2015 Sterling Vineyard Sauvignon Blanc Napa Valley. This wine was nice and refreshing with flavors of orange citrus and grapefruit. I was in my happy place. I was so impressed with the staff and the lobby. The main room was styled in contemporary casual accents and was very inviting. I noticed clean lines in the design and bright white detailing throughout the main house. What a great space for a tasting! We toured the property and the production site. The winery has nine different regional vineyards on site. Sterling was founded in 1964 by Peter Newton. The Director of Winemaking is Harry Hansen. We toured the Overlook and viewed the Crush Pad. I was surprised to see square concrete tanks. Most wineries actually use square if they are serious about concrete, the ones who use eggs do so for small batches. 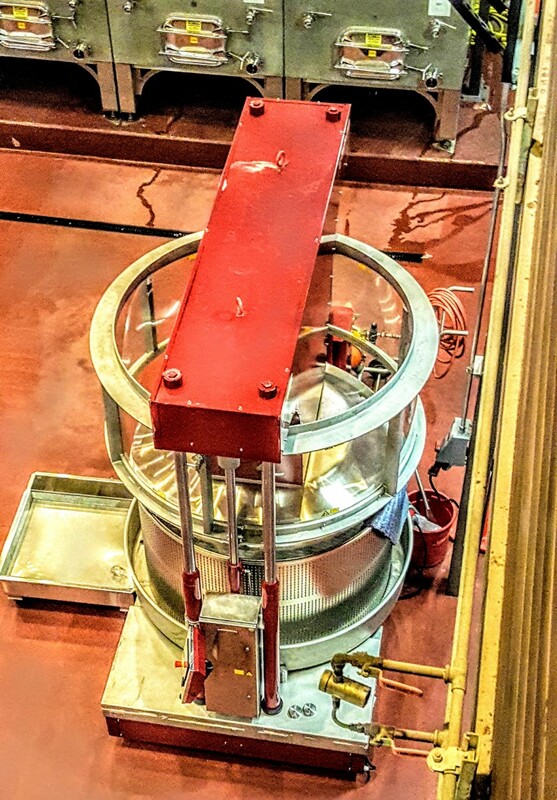 The square tank is a more efficient use of limited winery floor space than the egg or conical tanks. 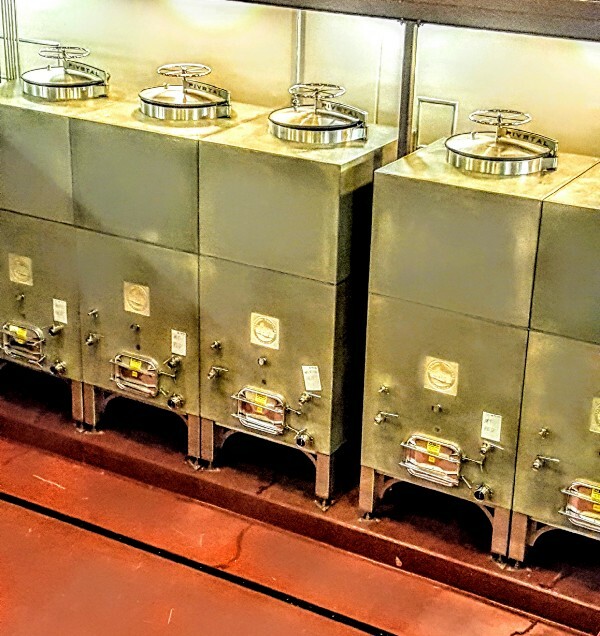 Stainless fittings may be moved to mirror the adjacent tank. This 2016 Malvasia Bianca (Italian pronunciation: [malvaˈziːa], was offered at the end of our tour. This bottle retails for $32. The nose was filled with fruity and floral undertones and hints of spice. I smelled off-dry flavors of citrus orange, white peach, and candied ginger. I would crush this in the summertime. 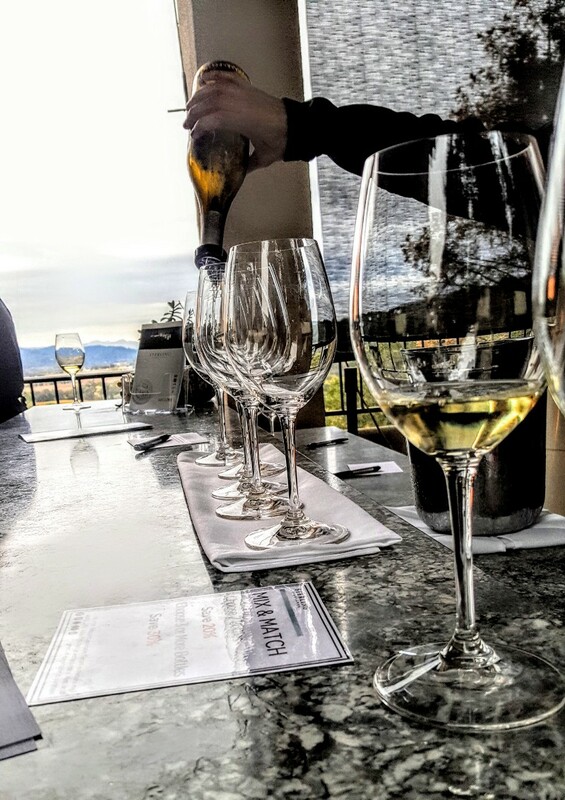 Malvasia is a group of wine grape varieties grown historically in the Mediterranean region, Balearic Islands, Canary Islands and the island of Madeira, but now is grown in many of the wine making regions of the world. This grape like a drier climate. They are temperamental. We eventually made it back to the Main House for the actual tasting. 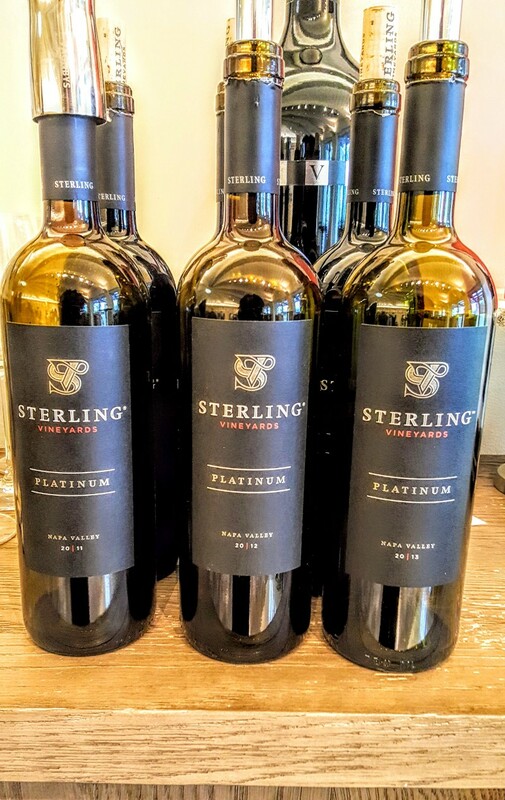 Sterling offers three tasting options. 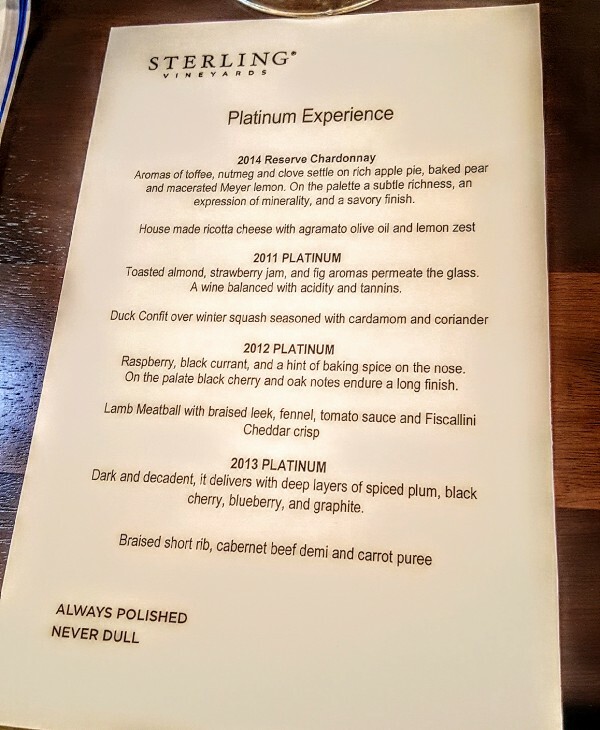 The Platinum,the Silver, and a General tasting, ranging from $35 to $75 per person. 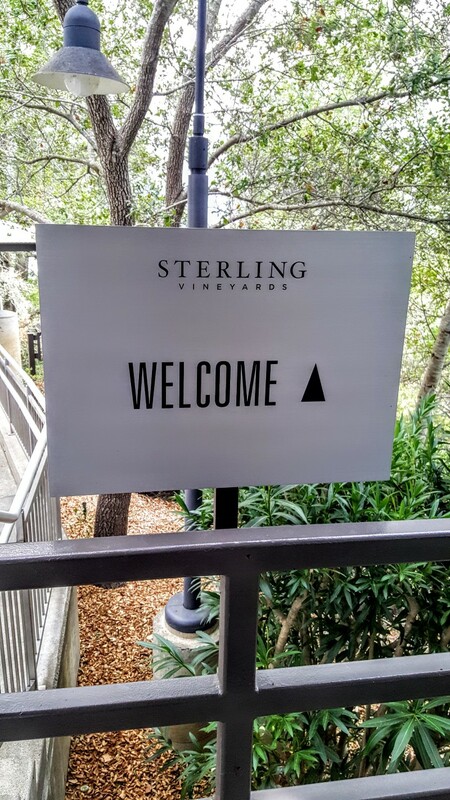 Sterling is open daily from 10-5pm . 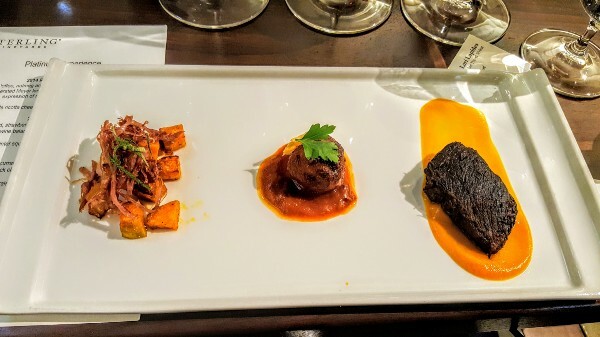 In addition, they offer several Wine Club level memberships. 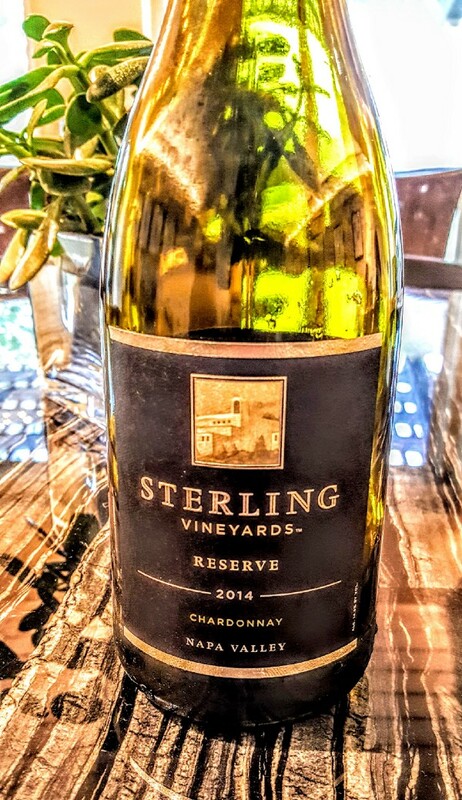 1st Course: The 2014 Reserve Chardonnay $20 was the first selection of the tasting flight. I knew things were looking up when saw I the Oaked Chardonnay glass by Riedel. I have a glass at home. I love mine to pieces. The Chardonnay had aromas of toasted nutmeg with yellow apple and a hint of citrus lemon. 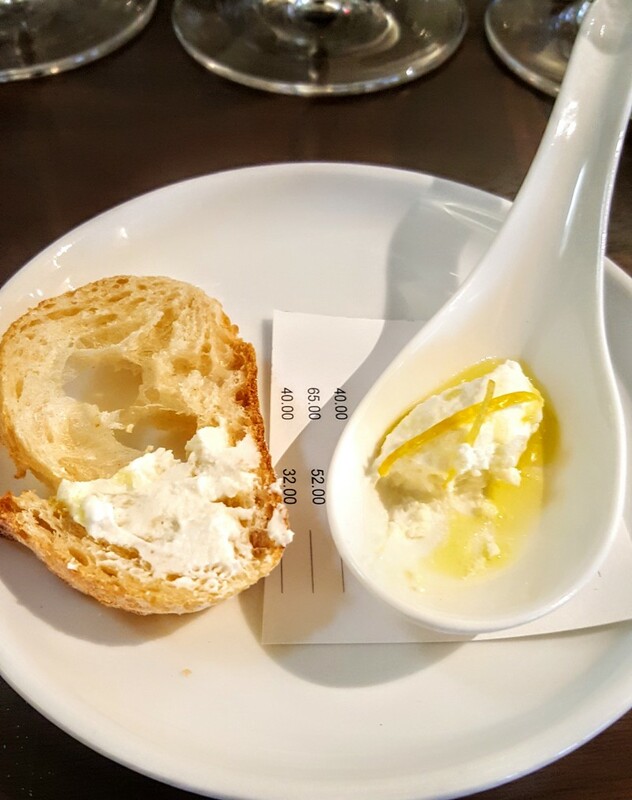 They paired the wine with house made Ricotta Cheese, Argamato Olive Oil,and Lemon Zest. It was light and airy with a mild flavor. The lemon zest brought out the citrus notes in the wine. Let’s be clear. I do not like ricotta. We are not friends. We don’t talk at all. EVER!! It is my least favorite cheese. However, Chef Kua Speer’s deft handiwork was evident. The texture was smooth. Most ricotta is textured. I was very impressed. 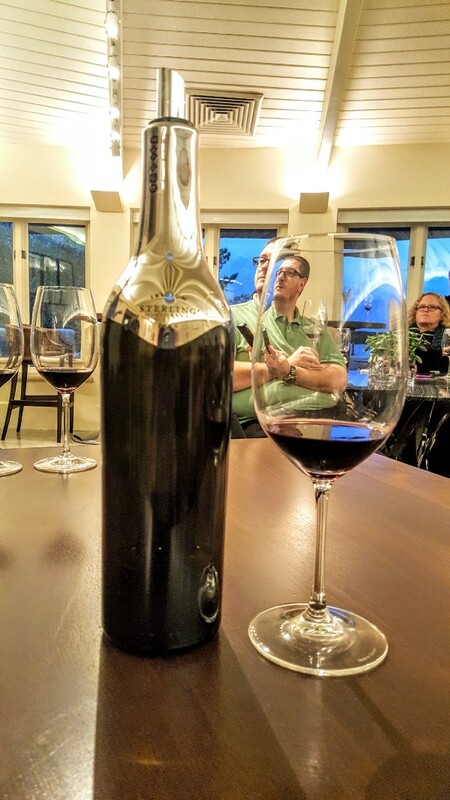 Iridium 2014 ($250) was the bonus star of the tasting. I wonder why? First of all, did you see the bottle? DID YOU SEE THE BOTTLE!! I asked for the empty bottle. I was not successful in obtaining it. This may be the only thing I have in common with Sterling Brown. We both have had the opportunity to drink this outstanding selection. 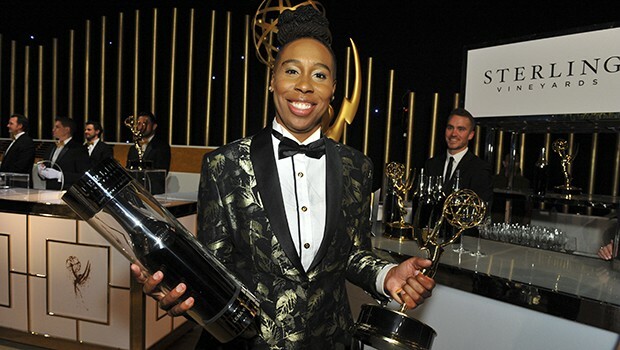 Sterling Vineyard was the exclusive partner for the 69th Emmy Awards. They are the exclusive Wine Sponsor for the second year in a row. This luxurious Cabernet Sauvignon was sourced from Premium Napa Valley Vineyards. Made with the best vintages from 100% Cabernet Sauvignon. The name comes from the element Iridium (IR) of the platinum metal group. The wine was poured for all the Emmy winners, guests, and nominees. 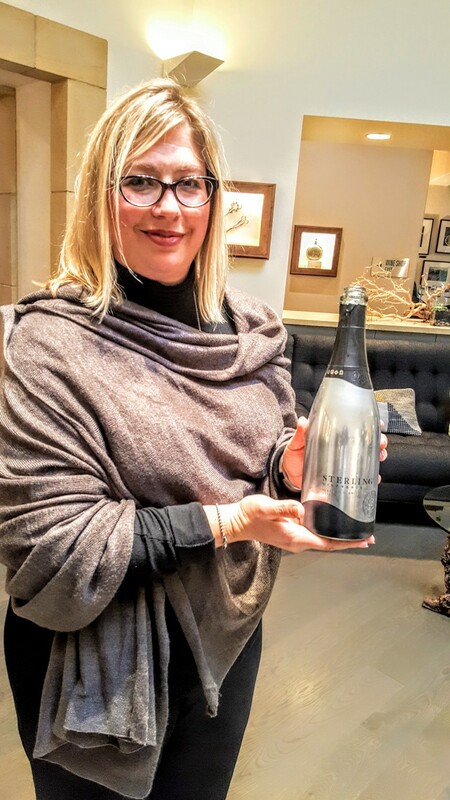 This bottle was also served at the Governors Ball on Sunday, September 17th. The official release was on November 4th. Henry Hansen is the Director of Wine Making. He has been with Sterling since 2011. He has a background in Genetics and Enology. 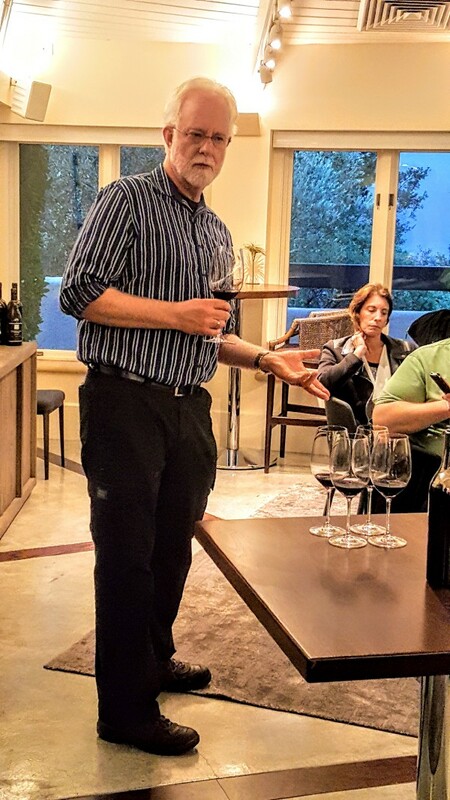 Mr. Hansen is leading the vineyard with award winning elegance. He was gracious enough to open 2 bottles of the GOOD JUICE!! Iridium has an intense almost inky purple coloring. The wine is rounded with silky tannins. The nose is powerful with aromas of cassis, dark berries, and hints of meaty spice. The wine is full-bodied with primary flavors of black fruit. GREAT FOOD WINE!! BE SELFISH AND HIDE THIS FROM EVERYONE!! Did I mention this was our 1st tasting. What a great time despite the rain. I am so grateful to the staff. Quinn and Ryan were awesome. 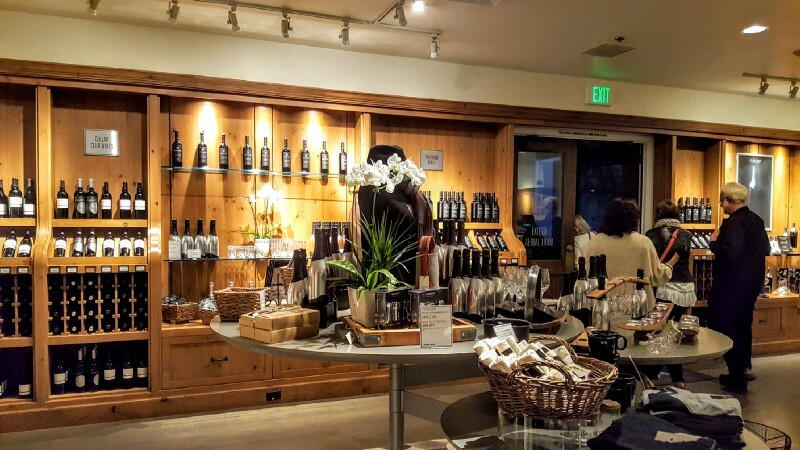 This should be a must stop on your wine travel list. Disclosure: Paid excursion via conference.